Find all of the missing pieces when you buy equipment and supplies from tastarsupply.com. tastarsupply is unique in the Western Pennsylvania area because we know Epson wide format printers, how to print accurate color (RGB and CMYK) and have expertise in computers (Macs and PCs) as well as computer networking. Our knowledgeable staff will provide good advice before the sale and the support that you need after the sale. Our website shows products and services that we believe in - tastarsupply.com isn't like other websites that try sell everything. We try to focus on products that will provide the best value for our customers. Inkjet inks for all popular Epson aqueous printers. Epson, Hahnemuhle, HP and Moab aqueous inkjet papers. 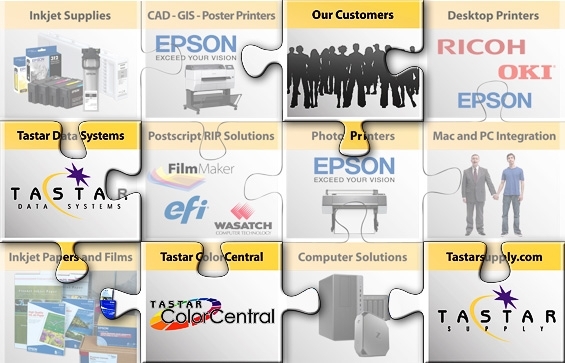 Epson authorized ProGraphics printer repair services. We can replace porous pads in desktop printers like the 1430, R3000, 3880, etc. And we can do routine maintenance (capping stations, damper assemblies, wipers, etc.) as well as print head replacements on the bigger aqueous printers, including the Stylus Pro, SureColor and T-series printers. Epson equipment keeps getting better as their technology is developed and refined. But, if your current printer meets your needs, our repair services can help you to keep it running well. Tastar ColorCentral is a great resource - it allows us to work with the products that we sell - both software and hardware - so that we really know what we are talking about. If you want to see what prints look like on different papers, check out the printed paper samples in our ColorCentral demo room, look at swatch books from paper suppliers, look at the detailed descriptions on our website, or talk to our staff about what paper would be best for your needs. Our on-site demo equipment allows you to see and try Epson wide format printers and RIP software. Know what you are getting before you get it - try prints on our demo equipment to make sure that Epson printers meet your needs. Or, if you need to do a few large format prints, we provide that service as well. We sell computers designed for business that are more robust and have fewer frills than the home computers that you'll find at the big box stores. Get a new notebook, desktop or all-in-one - we know computers and can recommend the model that would be best for you. Whether it's a Mac or a PC. Replace your mechanical hard drive with a fast solid state drive to give it new life, remove a nasty virus, or, replace a bad motherboard or other component. If your computer needs help, we can provide it. Get competitive pricing on every item that we sell. Free shipping on most orders over $150.00. Access to our Private Sales that are only available to website customers. And, don't worry, if you register, we won't bug you with email marketing - generally we send out about 1 email blast a month, and it's easy to opt-out if you like.